Volkswagen’s Virtual Engineering Laboratory in Wolfsburg is using augmented and virtual reality techniques to design cars of the future. In the laboratory two dozen screens flicker, some of them showing graphics and others hundreds of lines of program code. In the center of the room, there is a 1:4 scale model of a Golf. Frank Ostermann inspects the model, and then he changes its wheels, replaces the rear lights and modifies the wing mirrors. Ostermann uses voice commands and gestures to change the design. It is all completed in a matter of seconds. Augmented reality makes it possible. The software required was developed in the Virtual Engineering Lab and the team's results could revolutionize the work of engineers and designers. Ostermann is wearing ‘HoloLens’ mixed-reality goggles. The mobile computer developed by Microsoft projects virtual content onto a physical object through gesture control and voice commands. Ostermann only needs to point his finger and the HoloLens projects a different paint colour onto the Golf, installs different wheels and modifies the fenders. Initially, the Golf is an R-Line model but it then becomes an entirely new version. Perhaps this model will appear at the dealership in six months' time. Ostermann (52) is a graduate engineer in computer engineering. At Volkswagen in Wolfsburg, he heads the Virtual Engineering Laboratory, one of six labs now operated by Volkswagen Group IT in Wolfsburg, Berlin, Munich and San Francisco. The latest laboratory is currently starting operations in Barcelona. At these labs, specialists from Volkswagen are working on the digital future together with research institutions and technology partnerships. New solutions in the fields of big data, Industry 4.0, the Internet of things, connectivity, mobility services and virtual reality are being created in close cooperation. 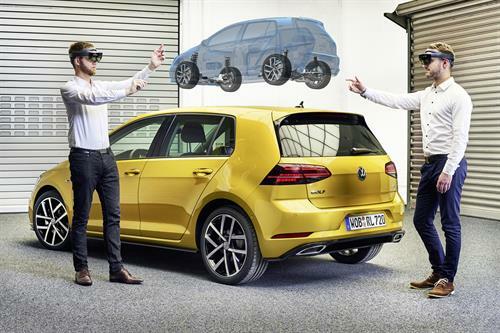 "At Volkswagen, we have been using augmented reality and virtual reality for some time, mainly to obtain a three-dimensional view," says Ostermann. "We are now taking a major step forward at the Virtual Engineering Lab. We are transforming this technology into a tool for Technical Development. This will allow Volkswagen engineers to work on a virtual vehicle, to change its equipment as they wish and even to design new components virtually. They will be able to see the results of their work immediately." "We are cooperating very closely with our colleagues from Technical Development and are already close to the first new vehicle concepts and design studies," Ostermann reports. "We contribute our know-how for technical product development and offer tailor-made solutions for all Group brands in the fields of virtual engineering and systems engineering." What is the reason for this approach? Augmented and virtual reality help save time and development costs. Each step in the process can be made faster and more efficient, for example with HoloLens software from the Virtual Engineering Lab. The HoloLens not only projects each design or equipment change directly onto the physical model. It also allows several project teams to work at the same time but at different places, for example teams from Wolfsburg, Chattanooga and Shanghai. All concerned always have the current design model in view and time-consuming reworking, for example on a clay model, may become a thing of the past. "The teams can directly follow and compare minimal changes to the model and then make a decision. This means that they can reach their goal faster," Ostermann explains. Currently, the HoloLens software is still in the trial phase. In future, it will allow users to call up the entire Volkswagen brand model portfolio and to present different body versions of a model in all conceivable variants: the developers will then be able to transform a saloon virtually into an SUV, an estate car, a convertible or a coupe. "Just a few years ago, this was all science fiction," says Ostermann. "Now it is clear that this is how we will be developing our next models."